Very handy designed and good looking Bluetooth talking with light LED display. Not just a speaker, but also a pleasant home furniture. It can also be taken on vacation, camping and friends collect to enjoy outdoor super basse. 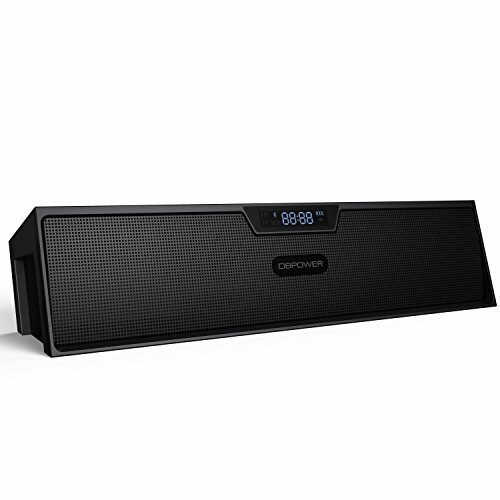 Multifunction Bluetooth speakers with high-quality FM radio (87.5-108MHz) and alarm clock. USB / TF / AUX / Bluetooth 4 types of connections. Built-in microphone for hands-free phone calls. High performance Bluetooth 2.1 + EDR can be connected up to 20 m. Wireless connection with your iPhone, iPad, mobile phones, tablets, iPods, computers, etc. Massive 1500mAh power allows you to enjoy music from sunrise to sunset. Li battery provides 5 days stand-by, 6+ hours of music time. You can even load your phone for emergencies. 30 day reimbursement and product lifetime warranty. DBPOWER Portable Wireless Speaker: High performance Bluetooth Technology, can be connected up to 20m (open place). With this Bluetooth Stereo Speakers you could enjoy wireless music wherever you are. Premium high definition sound: Two powerful Φ45mm 3Ω 2x 3W speakers and 2*5W Enhanced Bass Resonator provide solid surround sound and deep bass for a full-range listening experience. Multifunction bluetooth speaker: There is a LCD display for time setting/alarm clock/FM radio/battery power/Bluetooth. And also built-in microphone for hands-free phone calls. The device supports phone redial and reporting function. Enjoy wireless music from your SD Card/TF card/USB/Bluetooth, or play music through an Aux-in line. Rechargeable Li battery provides up to 8 hours of playback time. Compatible devices: Dual Speakers 80Hz-20000Hz Bluetooth Speaker works for iPhone,iPad, iPod,Mac Book,Samsung Galaxy,Kindle Fire,Nexus,laptop,computer and car.